The US House of Representatives and Senate have convened for the 116th Congress with the most diverse class of politicians in history. The House is returning the first woman to the speaker’s office as Democrats take the majority with a large class of new lawmakers. They are ready to confront President Donald Trump in a new era of divided government, with Republicans still controlling the Senate. It is also the first new Congress to convene during a partial government shutdown, now in its 13th day over Mr Trump’s demands for money for a southern border wall. Nancy Pelosi, the Democratic leader, has pledged to make Congress work for all Americans. But her party is also ready to challenge Mr Trump with investigations that threaten the White House agenda. 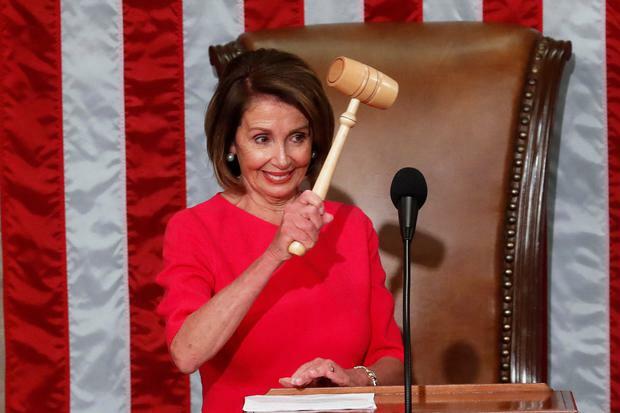 Ms Pelosi, elected speaker 220-192, took the gavel saying voters opted for a “new dawn” in the November election and are looking to “the beauty of our Constitution” to provide checks and balances on power. She faced 15 “no” votes from fellow Democrats. She also vowed “to restore integrity to government, so that people can have confidence that government works for the public interest, not the special interests”. The day was unfolding as one of both celebration and impatience. Newly elected lawmakers arrived, often with friends and families in tow, to take the oath of office and pose for ceremonial photos. The Democrats planned to quickly pass legislation to re-open the government, but without the funding Mr Trump is demanding for his promised border wall. Vice President Mike Pence swore in newly-elected senators, but Senate Republicans under Majority Leader Mitch McConnell had no plans to consider the House bills to fund the government unless Mr Trump agrees to sign them into law. That ensures the shutdown will continue, clouding the first days of the new session. It is a time of stark national political division that some analysts say is on par with the Civil War era. Battle lines are drawn not just between Democrats and Republicans but within the parties themselves, splintered by their left and right flanks. Ms Pelosi defied history in returning to the speaker’s office after eight years in the minority, overcoming internal opposition from Democrats demanding a new generation of leaders. She will be the first to regain the gavel since legendary Sam Rayburn of Texas in 1955. Putting Ms Pelosi’s name forward for nomination, incoming Democratic caucus chair Hakeem Jeffries recounted her previous accomplishments – passing the Affordable Care Act, helping the country out of the Great Recession – as preludes to her next ones. He called her leadership “unparalleled in modern American history”. She said she would cast a no vote on a new package of rules to govern the House. Ms Ocasio-Cortez and other liberals oppose the pay-as-you-go budget provisions in the rules package that would allow restrictive objections to any legislation that would add to federal deficits. They say such restraints would hamstring Democratic efforts to invest in health care, education and develop a Green New Deal of renewable energy infrastructure projects to fight climate change. Republicans face their own internal battles beyond just the conservative House Freedom Caucus, but as they decide how closely to tie their political fortunes to Mr Trump. GOP leader Kevin McCarthy’s name was put into nomination by his party’s caucus chair, Liz Cheney, the daughter of the former vice president. She said Mr McCarthy knows “our rights come from God” and “government is not the source of our liberty”. Many GOP senators are up for re-election in 2020 in states, including Colorado and Maine, where voters have mixed views of Mr Trump’s performance in the White House. Mr Trump, whose own bid for 2020 already is underway, faces potential challenges from the ranks of Senate Democrats under Chuck Schumer. He had little to say as the new Congress was convening, but he did tweet an attack on one of his likely presidential challengers, Senator Elizabeth Warren, mocking her claim to Native American ancestry. The halls of the Capitol were bustling with arrivals, children in the arms of many new lawmakers. Emanuel Cleaver opened the House prayer asking at “a time fraught with tribalism at home and turbulence abroad” that lawmakers “become the architects of a kindlier nation”. Overnight, Ilhan Omar tweeted a picture with her family at the airport.